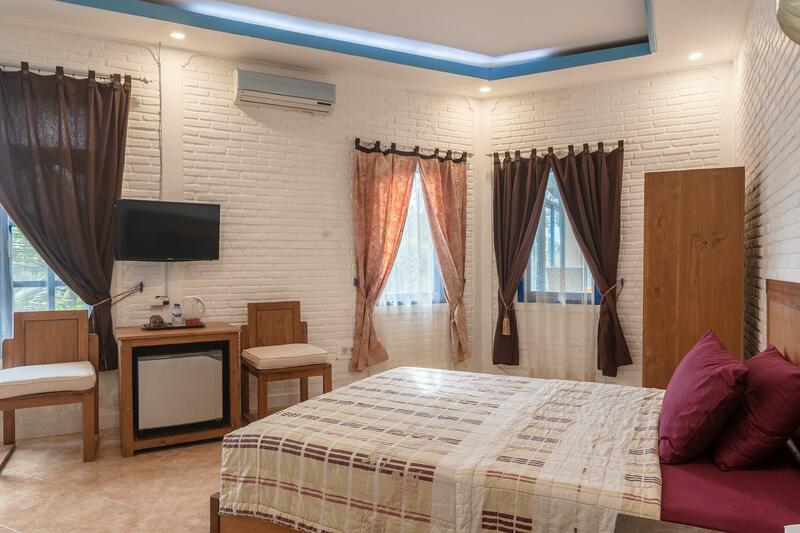 Ada pertanyaan untuk Kudos Guesthouse Ubud? Guest House Kudos, terletak di Ubud Bali adalah pilihan yang populer bagi para wisatawan. Dari sini, para tamu dapat menikmati akses mudah ke semua hal yang dapat ditemukan di sebuah kota yang aktif ini. Hotel modern ini terletak di sekitar obyek wisata populer kota ini seperti The Yoga Barn, Eclectik, Kebun Raya Ubud. Gunakan kesempatan untuk menikmati pelayanan dan fasilitas yang tidak tertandingi di hotel Bali ini. Hotel ini menyediakan akses ke sejumlah pelayanan, termasuk WiFi gratis di semua kamar, resepsionis 24 jam, penyimpanan barang, Wi-fi di tempat umum, parkir valet. 6 kamar yang tersebar di 2 lantai memberikan suasana hangat dan menyenangkan ketika Anda jauh dari rumah. Kenyamanan modern seperti akses internet - WiFi, akses internet WiFi (gratis), AC, bar mini, balkon/teras dapat di temukan di beberapa kamar. Fasilitas hiburan hotel ini seperti pijat, taman dirancang untuk bersantai. Ketika Anda mencari penginapan yang nyaman di Bali, jadikanlah Guest House Kudos rumah Anda ketika Anda berlibur. Benar2 hotel yang nyaman dan sempat menyesal kenapa tidak stay lebih lama diubud. Harga dan layanan sangat sepadan. Kamar luas dan bersih. Dapat pemanas air serta teh dan kopi. Tadinya tidak menyangka dengan harga seperti itu di kamar ada tv satelit dan free wifi. Jaraknya memang cukup jauh dari pusat ubud. Tapi karena kami langsung sewa motor jadi tidak terlalu jadi masalah. the room is unexpectedly large & nice. And i dont think that i have found a hotel owner as helpful as Annie. By staying there, i can rent a bike, arrange a transport and joining a tour package without having to pay additional hotel fees. For sure, I'll be back here for my next visit to Ubud. Guest House Kudos is a lovely guesthouse. The room we were in looked out on to the padi fields and it was peaceful and green. We had our breakfast (we picked up cut fruit and treats at the market the night before) on the quiet and pretty patio that again looked out at coconut trees and greens. I really liked this hostel but it takes twenty minutes to walk to town and there are no sidewalks for part of it with motorcycles rushing by. It was amazing, we got a big Room, same we order on Pictures. It was so clean and everyday we got Origami Towels , we had a wounderful time there. Everyone was so friendly to us, we got best breakfast in World, very delicious. We got a driver , who was very friendly too and drove us safety to every place. We got offers for booking Event's, it was Amazing like Elefant Safari, Temple Tour, vistit Beaches. When we travel to Bali again, we like stay there again. I spent 4 nights at Kudos after initially booking 3 nights. I had the exquisite room which is very large, clean and comfortable, with tv (local channels), fridge, hot water, a/c, kettle with tea and coffee. I had a very comfortable stay and Ani the manager was very friendly and always there to help. She helped me rent a scooter, order food delivery, book a cycling trip with eco-tours (recommended) and a shuttle service to other parts of Bali. The hotel is about 2-3km from the main centre in beautiful surroundings and it's also very quiet and peaceful so I recommend renting a scooter if you feel confident enough, or go for a long nice walk :) The breakfast was delicious with a generous portion. Overall my stay at Kudos was very comfortable and the value is very good (Ubud is not cheap!) and Ani truly works hard to ensure you have everything you need. She also has some very cute well-behaved pets so it truly felt like being at home! Would return. The rooms, the staff, the value for your money. I enjoyed my first week there so much that I booked a second week and then after some traveling in Bali, I came back to finish my last week there before coming back to U.S. The Manager, Ani is gracious and extremely helpful. She takes personal pride in making sure that each guest has a memorable stay. Often you see pictures of a hotel and then become disappointed when you arrive and it is not what they claimed it to be. This is not so for Guest House Kudos. The place, the accommodations and everything they claim about this place IS exactly what you will find. Close enough to central Ubud that you can walk to it within about 1/2 hour, yet far enough away for it to feel rural, peaceful and quiet. I would recommend this place to everyone. 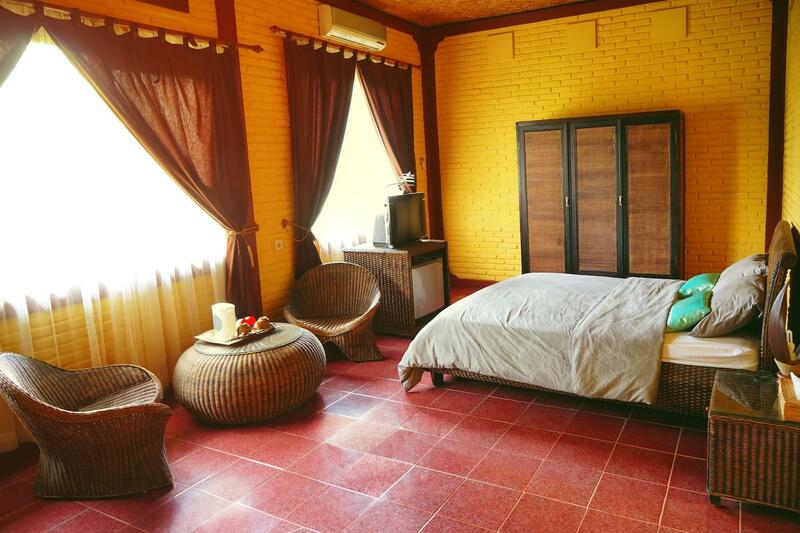 The guesthouse is about 3km from the center of Ubud (markets, shops). This is a quiet place surrounded by rice paddies. Our room in the guesthouse was very spacious. The manager was very accommodating and helpful. She helped us with our tours--suggesting affordable ones, and booked it for us. We were able to save so much because of her help. This is a guesthouse not a hotel. So the place was very private and we felt very comfortable. Our room did not have a safety deposit box--but our things were secured. The service was amazing. The woman who runs the guest house couldn't be any better she really made our stay memorable. It was a very pretty quest house with comfortable although not luxurious rooms. Brief but memorable. The guest house is a little walk out of town. This gives advantages of stunning views from the pool. The pool in 300 metres walk from the guest house but beautiful when you are there. The guest house is basic but clean and well run. The service is fantastic and any thing that you might want is taken care of by the owner who is brilliant. I really can't stress enough how good the service was. By far the best I have ever experienced in 4 months in SE asia! Staying at Guesthouse Kudos was very nice, it is located slightly further from the centre but taking a motorbike or car would get you there pretty fast. The lady runnning the place is one of the most friendly and helpful staff i've ever met which makes you feel at ease and quite at home. You'll get a good sleep here with the peace and quiet and comfortable bed. I will definitely stay here again when i visit Ubud..
My stay would have been great if the manager weren't so awful. For starters, there is no pool or massage services. When I tried to cancel my second night because of this, she told me to go through Agoda, which took almost an hour because of the poor wifi and bad phone connection. When I changed my mind because I was too sick the next day to go find another place (after all, the room was very nice), she insisted I book again through agoda and would not deal with me directly unless I paid an extra 60k. When I tried to get a taxi to my new hotel in town, she wanted me to pay 100k, and through her hands in the air and walked away when i tried to negotiate the price. She did that every time anyone did anything to make her remotely unhappy. She suggested her staff drive me on his bike to ubud palace, then drive back and pick up my luggage, then bring it back to me and make me walk the next 15 minutes. She wanted a huge price for that, and I told he that if I'm going to pay like that, then I want to be taken all the way to my hotel. Again, she just walked off without a word. So, I got on my motorbike (which I rented from a third party), and she saw me and got angry and pulled the key out of the bike. She said this was because she was responsible if anything happened to the bike (nonsense), which is funny because she was going to have her staff do the same thing, and I've been riding motorcycles since he was a baby. To boot, I had to leave my bike in the road and come pound on her door (no response with simple asking or knocking) just to get her to come open the bike so i could get my purse out of it. So yeah, nice hotel, friendly front desk staff, cool dogs, awful manager. Wouldn't stay there again if you paid me. Annie and her dog. Annie helped us book our boat to the Gili's and it was only $70 per person. she also had scooters we rented for $6 for the day. She also had great suggestions for food close by. The pool is not on the property, it is next door. The twin room was large, plenty of room for my step-daughter and I. The place was reasonably clean and it's nice and quiet. Paula's up the street has the best breakfast. Very friendly owner. We felt like staying home. Need a car or motorbike to get to the town.